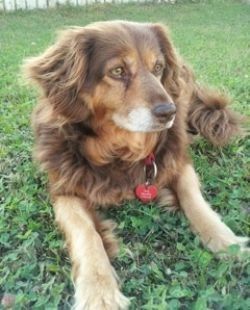 This beauty is a senior gal currently residing in St. John’s, NL. Keisha’s quiet, laid back disposition makes her perfect with children and other dogs. Because of her age and arthritis, she isn’t too energetic but she still loves her daily walks and loves nothing more than a good belly rub. She does not like to be left alone and because of this, it would be ideal if she was adopted into a family where someone was home most of the time. This entry was posted in Dog of the Day, Pet Rescue, St. John's and tagged adoption, animal adoption, animal rescue, dogs, St. John's by Raquel. Bookmark the permalink.